We found inspiration for our Single Origin Coffee Project in the provenance found with most historically relevant spirits. When tracing the roots for any classically made alcohol, they reek with origin. As craft distillation continues to boom, it becomes harder and harder to produce a wide range of products with expression of hometown flavor. Many regions, specifically N. Florida, aren't known for their ability to grow fermentable or edible crop. So for this project, we looked to the origin of the main ingredient. We wanted this series of liqueurs to pay homage to those who are growing the bean, which plays leading role. Bold Bean Coffee Roasters, which is based in Jacksonville, FL, is a pioneer of sourcing/importing single origin green coffee to supply the third wave movement happening worldwide. With their coffee grower resources we had our pick of regions and were confident we could build an entire series around this center point. The first batch focused on the Guatemalan estate Finca Twi'Ha. This estate, based in the Huehuetenango region of Guatemala offered a robust base coffee to build from. We utilized Black Cardamom, Cinnamon, Cacao Nibs, and Allspice, all of which can be found natively growing there. To sweeten the liqueur we used the native dark, unrefined sugar Panela. 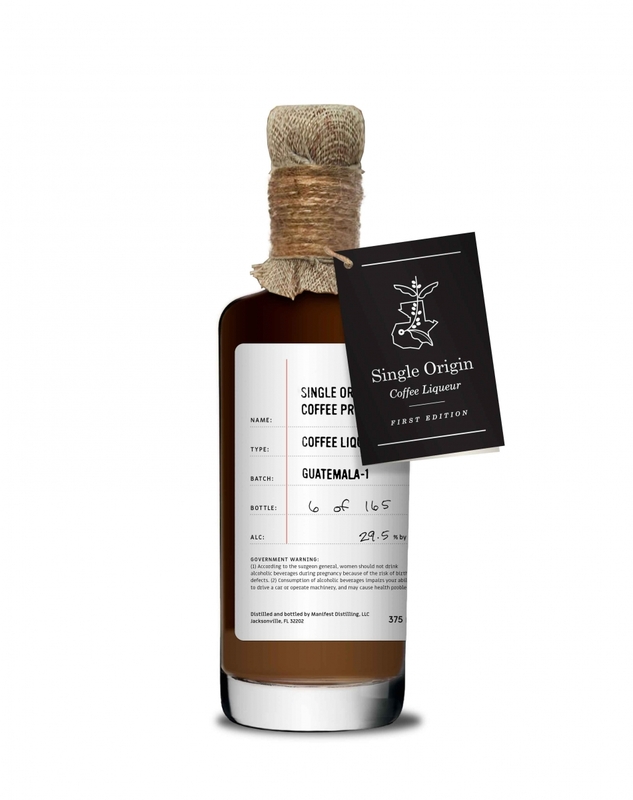 Since coffee oxidizes very quickly, we relied on Bold Bean to cold brew a concentrated coffee, which was then mixed within 12 hours with a corn neutral spirit that had been vapor-distilled with roasted coffee beans and our flavored maceration. This allowed for the spirit to stabilize the coffee and prevent any further oxidation. Batch 1 of the Guatemalan liqueur was limited to 369 bottles and won't be returning until fall 2019. Manifest is currently in development on a Columbian coffee recipe.